This is me back in 2002. I made this transformation as part of a contest for a nutritional supplement company. Basically, I had to use at least one of their products and take before and after photos 90 days apart. If I won, I would get $50,000 and they would use the pictures in their ads. These pictures are not altered in any way. There has been no photoshopping or airbrushing. These photos show what is possible if someone is willing to do some hard work and practice nutritional discipline. However there are three things that the photos do not tell you. 1. 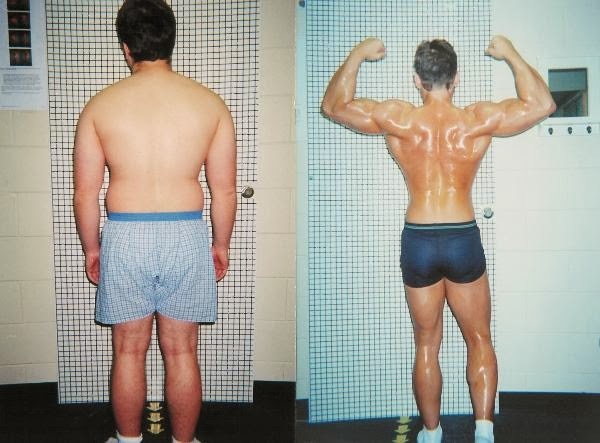 The before picture is usually and off-season bodybuilder or fitness model. Despite my appearance in the before pictures, I was not a sedentary couch potato. I was an experienced bodybuilder. Physique enhancement had been my hobby, passion and obsession. I competed in drug tested bodybuilding as a teenager and even won a few trophies. I knew how to alter my training and nutrition to fine tune my physique. I was an experienced weight lifter with above average muscle beneath the layer of fat depicted in the pre-transformation picture. I knew how get the lean, defined look in a period of 12 weeks, and was willing to do the necessary work. 1. An impressive transformation can be staged in the same day by adjusting a few simple variables. Tanned skin and skilled posing helped me look better in the post-transformation photos. Also, I knew how to manipulate the fluid levels in my body to enhance or worsen my appearance in pictures. Most fitness models and bodybuilders do this for photo shoots. In the before picture I was carrying about six extra pounds of fluid. This gave me a soft, bloated look. In the after picture, I purposely eliminated the fluid beneath my skin to give my body a more defined look. Basically, I was dehydrated. If I had tried to do much more than pose, I would have had severe muscle cramps. 3. After photos show a physique that is not sustainable for more than a few days. Unfortunately the lifestyle that created the after pictures was not sustainable for me. I could not maintain that low level of body fat year-round. The extremes required to create that much physique change in such a short time were obsessive. I had a tendency to go to extremes back then. I was in treatment for alcoholism a year after this “transformation”, so obviously I found neither peace of mind, nor a permanent healthy lifestyle from this endeavor. Author:Nick Ortego is a health coach specializing in biohacking for runners. He integrates modern methods with the ancient wisdom of yoga to help runners get the most out of every aspect of life. He is the owner of N 2 Action, a wellness studio in Baton Rouge, Louisiana, offering personal training, health coaching, yoga, and fascial stretch therapy. Pingback: The Fat Burning Runner: Discover Why and How to Burn Fat for Fuel and Run Longer and Faster Than Ever | Run Better Now!